Every 26 months, Mars and Earth are at the greatest distance, about 57 million kilometers apart. If at that time an unmanned NASA spacecraft left the Earth and traveled 58,000 kilometers an hour, it would take a little over 40 days to reach the Red Planet. Not bad, right? Well, a quick voyage would only be possible if the spaceship took a direct route unimpaired by the wrath of the solar system and the weight of life-sustaining resources. Unfortunately, space travel is much more complicated than a straight line. .9 years. Every time Mars goes into orbit, the Earth rotates almost twice around the Sun. Historically, the best launch window for Mars is every 26 months for NASA. During this time, a spacecraft can follow the planet known as the most energy-efficient route to Mars, known as the Hohmann transfer orbit. After launch, the spaceship follows an elliptical orbit around the sun, which intersects the orbit of Mars. It uses fuel to increase speed and speed to free itself from the Earth's gravity field. And the spacecraft uses more fuel to decelerate to get into Mars orbit. Then it can ride Mars Orbital Wave until it is ready to touch the surface. While the Hohmann transfer is regarded as the most efficient trajectory to Mars, the journey with a manned chemical-powered spaceship is still estimated at 260 days or eight to nine months, so NASA and private companies are trying to develop more efficient propulsion systems that can get people to Mars faster than the chemical missiles used in the past. More specifically, a type of electric propulsion that powers spacecraft by accelerating a stream of electrically charged atoms known as ions. And Nuclear Thermal Propulsion, which uses low-enriched uranium as an energy source. But even if we make a faster route to Mars, a round trip is still estimated to take several months. And that means we also need to solve human health problems and resource demands during extended space missions. Time is just one of the many obstacles in our way. 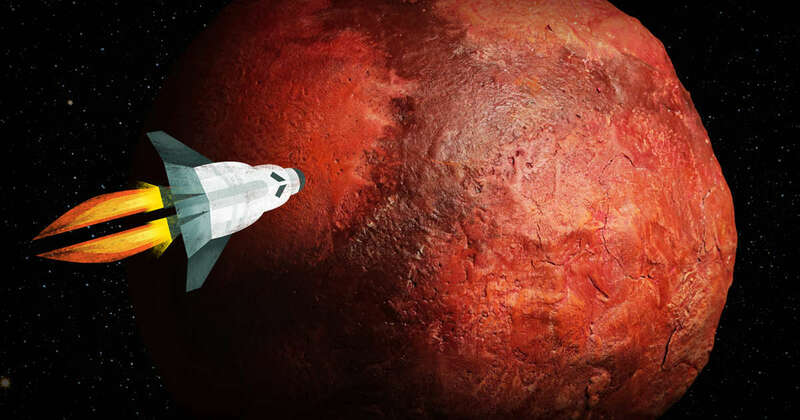 Nevertheless, NASA says it plans to send people to Mars in the 2030s.